You'll have to excuse me, this post is (approximately) two months late. 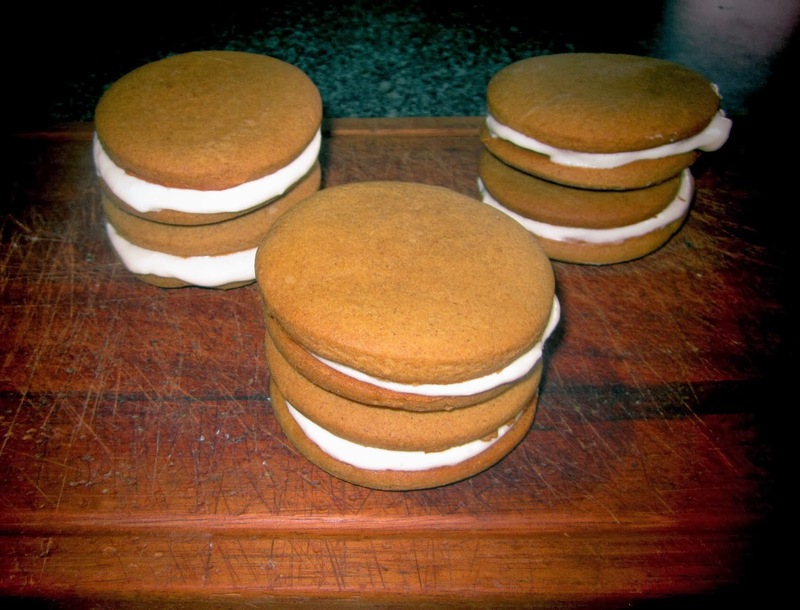 But it's a Whoopie Pie recipe that's just too good not to share. Ignore the references to Christmas, make these delicious little pies and eat them while relaxing in front of a roaring fire during the next snow fall. Just before Christmas Toronto was hit with a massive ice storm that knocked out power to a large part of the city and brought everything to a grinding halt. For me it meant a day off from work, prepping Christmas cookies with my sister. 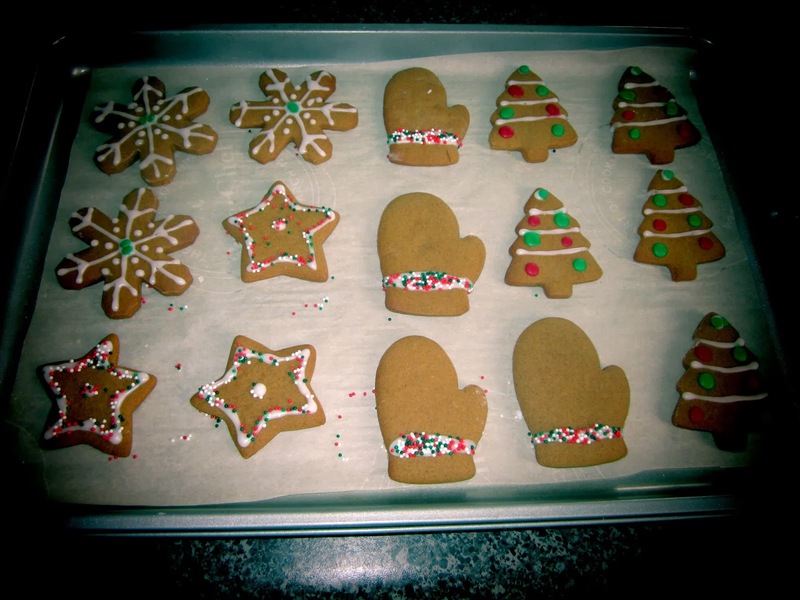 We decided to make classic gingerbread cookies in adorable winter shapes - mittens, snowflakes, Christmas trees. After we had decorated these cookies to our hearts content, we decided to experiment with the remaining dough. 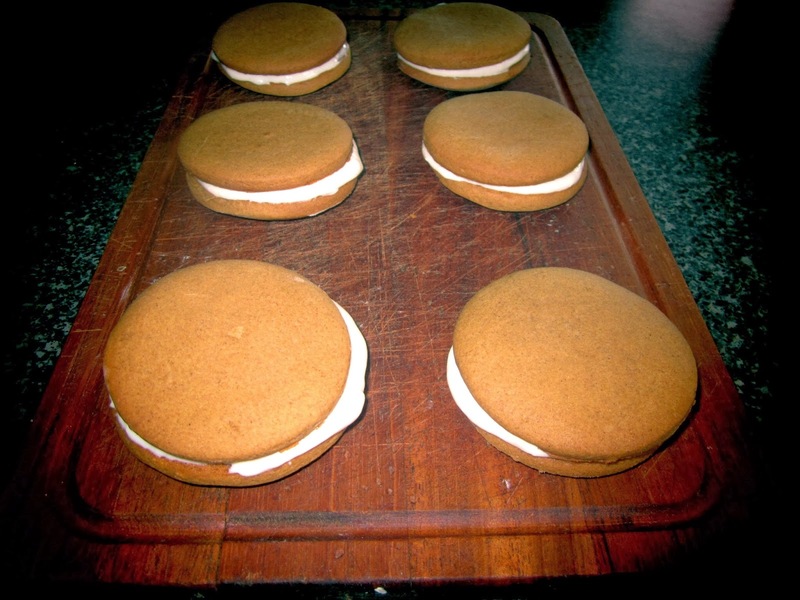 Whoopie Pies are usually made of two chocolate, cake-like cookies sandwiching icing. Not to knock the chocolate variety, but the gingerbread version of these delicious cakes is that much better! 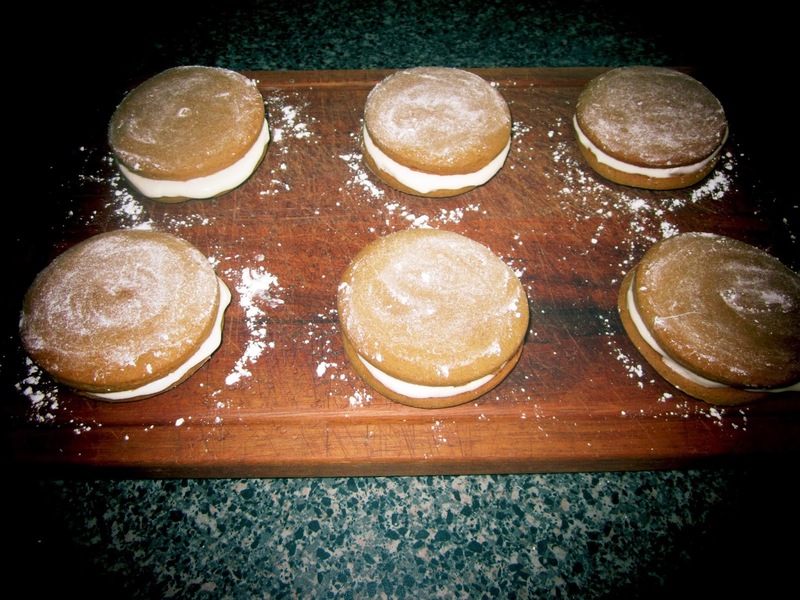 The combination of spice, sweetness and tang from the cream cheese icing makes these Whoopie Pies a perfect winter treat. Stir 2 cups flour with ginger, cinnamon, allspice, salt and baking soda in a large bowl. Make a well in the centre and set aside. Beat butter with brown sugar in a bowl, using an electric mixer on medium for 2 minutes. Beat in egg and molasses. Pour molasses mixture into flour mixture and stir until all flour is combined. Stir in remaining cup of flour, 3/4 cup at a time, until dough is no longer sticky but still soft. Divide dough into 4 portions, form into discs and wrap in plastic wrap. Refrigerate until chilled for at least 30 minutes. Preheat your oven to 350. Line a baking sheet with parchment paper and set aside. Roll out 1 disc of dough on a floured surface until 1/8 inch thick. Cut into rounds (if you don't have a round cookie cutter, use a glass) and transfer to the baking sheet. Bake for 7 to 10 minutes until deep brown around the edges. Transfer the cookies to a wire rack and cool. Meanwhile, beat the cream cheese and vanilla. Mix in the icing sugar in 2 additions until smooth. To assemble, spread 1 tablespoon of the icing onto one cookie. Place another cookie on top and lightly press until the icing reaches the edges of the cookie. Feel free to dust the pies with some icing sugar.